Recorded at Creation Audio, Minneapolis, USA on January 8, 2008. Cover art by Emmanuel Guibert. This all-improvised session by three of my favorite musicians caught me by surprise the night I first listen to the rough mixes at my friend (and co-producer) Philippe Ghielmetti's home, while having a glass of wine. On my way back home, I could still hear the tunes that the trio had spontaneously created with this sole plan for the session: “Let’s find some music, somewhere… over the rainbow”. 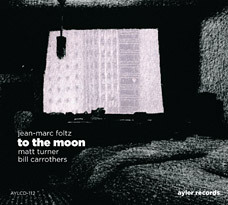 As Jean-Marc Foltz puts it in his liner notes, they went right to the Moon. Meet us there.